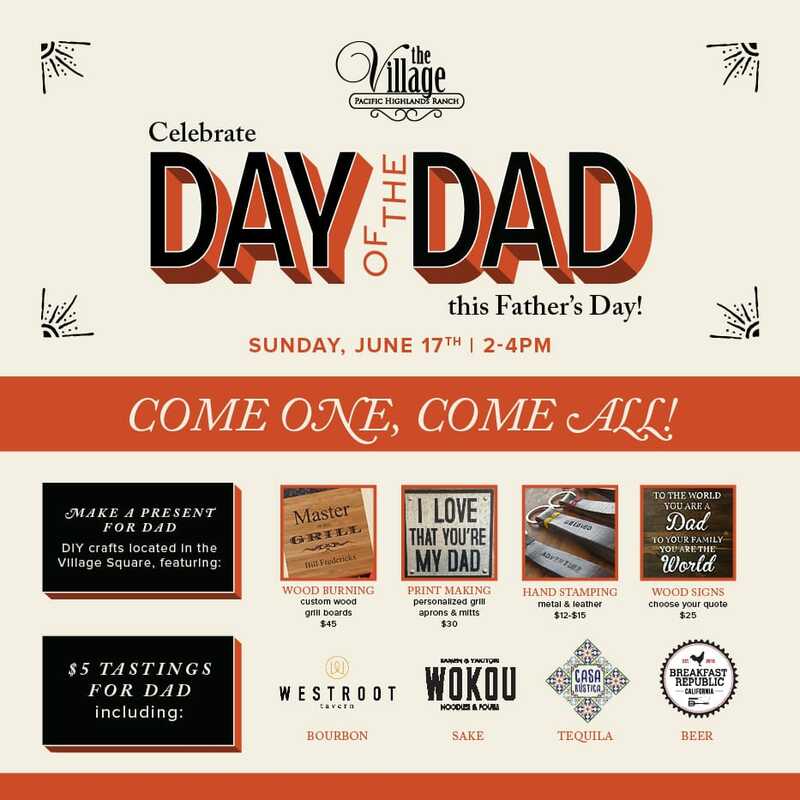 Carmel Valley Celebrates Father’s Day in Style!The Village at Pacific Highlands Ranch is doing it up this Father’s Day, with an event that honors all dads! On Sunday, June 17th, from 2:00 p.m. to 4:00 p.m., folks will be invited to come for some “fun in the sun”A DIY craft terrace will be set up in the Village Square, where moms and kids can choose to make exciting gifts for dad (for a nominal fee), such as custom wood-burnished grill boards, hand-stamped metal and leather items, personalized aprons and oven/grill mitts, plus a handsome variety of wood signs. For dads, restaurants in The Village will provide a celebratory selection of $5 tastings! Pop will really feel on top, as he is invited him to sample bourbon from Westroot, Sake at Wokou, tequila at Casa Rustica, and beer of course, compliments of the new Breakfast Republic. And for the whole family, a BBQ will be hosted in the Village Square, featuring the signature tastes of Westroot Tavern cuisine and “delicioso” street tacos from Casa Rustica. When: Father’s Day- Sunday, June 17th | 2:00 p.m. to 4:00 p.m.